Bumblebee Cottage in Skipsea, near Hornsea sleeps 9 people. 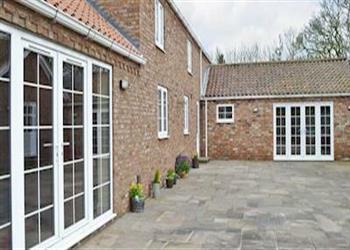 Bumblebee Cottage is an exceptional property of very high standards situated between Skipsea and Hornsea. What Bumblebee Cottage has is lots of space with a wonderful, large (22ft x 15ft) living room boasting its own wood burner for those cosy evenings in and high vaulted ceilings which add to its sense of space. Patio doors lead out to the patio with a hot tub where you can enjoy the bubbles whilst gazing up at the stars. A steam room in the main house is also an added bonus. The owner, who lives adjacent, has also thought about making children feel welcomed with a games room comprising of air hockey, table tennis, a Wii console, TV and retro arcade game guaranteed to keep them entertained for hours. From Bumblebee Cottage near Hornsea you can walk to Skipsea beach; and the advantage of Bumblebee Cottage is it’s central for exploring the area as a whole. The traditional seaside resorts of Bridlington and Hornsea are close by. Have a go at bird watching or sailing at Hornsea Mere or try a bit of retail therapy at Hornsea Freeport designer outlet. The town of Hornsea is full of little street cafes, public parks, restaurants and shops. It also has its own museum dedicated to the famous Hornsea Pottery. Hornsea is also the finishing point for the Trans Pennine Way. You can walk or cycle along these well maintained leisure trails. Skipsea is your nearest village with its local pub serving bar meals and the village shop/post office. Further afield and in less than an hour you can be in York or the City of Hull voted European City of Culture for 2017. Hull has one of the largest indoor aquariums in the UK known as ’The Deep’, see the sharks and stingrays as well as the stunning colours of the small less known varieties. The beach is 800 yards. With the shop and pub 1½ miles, and restaurant 4 miles from Bumblebee Cottage near Hornsea. Ground Floor: Step to the entrance. Kitchen/dining room: With gas range, microwave, fridge/freezer, coffee machine, dishwasher, wine cooler and 32" Freesat TV/DVD player. Bedroom 1: With king-size bed and TV/DVD player. First Floor: Bedroom 2: With king-size bed and en-suite with shower over bath, toilet and heated towel rail. Underfloor bio mass central heating, gas, electricity, bed linen, towels and Wi-Fi included. Initial logs for wood burner included. Travel cot and highchair available on request. Welcome pack. External games room with 32" TV/DVD for DVD and Wii use only (small DVD and Wii library), air hockey, table tennis, Wii, retro arcade machine and board games/steam room with seating for 4 and separate toilet. Large patio with garden furniture and Bar-be-que. 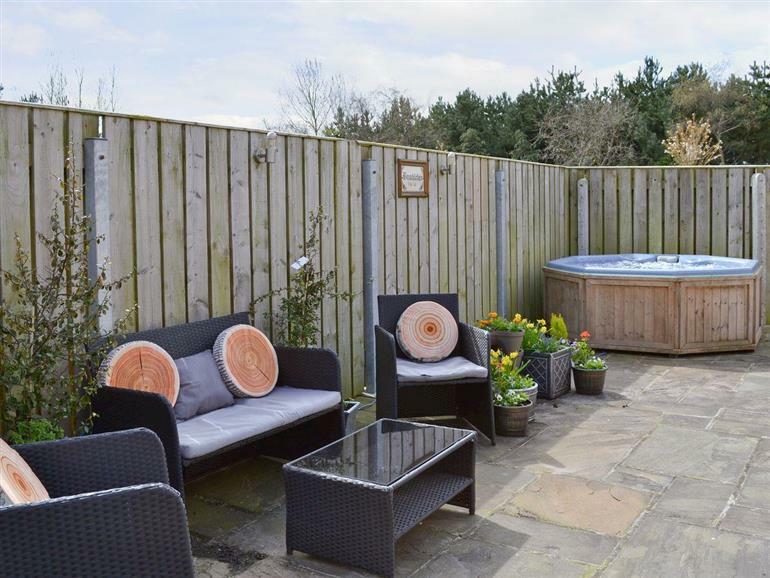 Bumblebee Cottage near Hornsea has a hot tub for 6-8. Private parking for 4 cars. No smoking. Please note: There is 1 step to the patio. Holidays at Bumblebee Cottage run from Friday to Friday. Pets allowed at Bumblebee Cottage. For a better idea of where Bumblebee Cottage is, you can see Bumblebee Cottage on the map below. Bumblebee Cottage is in North Humberside; should you be on the lookout for a special offer, you can find all the special offers in North Humberside. It's always worth checking to see what is on offer at the moment. Do you want to holiday near Bumblebee Cottage (UK2031), you can see other cottages within 25 miles of Bumblebee Cottage; have a look to find your perfect holiday location.